Praying for Nicole | House Unseen. Life Unscripted. Earlier this morning I tried to post a bunch of fluff and stuff, but the internet wouldn't cooperate and my pictures wouldn't load, so I slammed the computer shut and instead cleaned up the "mess" Mary had just made on the floor because she's wearing big girl undies for the first time today and just. doesn't. get it. Then I got an email about a girl that Tommy and I were at UD with and I knew that the fluff and stuff was supposed to wait. Nicole (Paparella) Fraser was always smiling. Always. Even at UD when I was very much my hard to love, pre-conversion self (now I'm still hard to love, but I work a lot at being nice, which I never did before, and that's all thanks to Jesus), she was nothing but kind to me. Now I understand it more, but then I didn't. I didn't understand how it could feel like she loved me even though I didn't know her. Now I know that it's because she actually did. Even though I wasn't knowable much less lovable, she still managed to exude a true Christian love. I wish I would have known her better then. Last week, an MRI revealed a large tumor attached to Nicole's brain stem. She is 14 weeks pregnant with her 6th child. Tomorrow, Tuesday, she will undergo surgery to remove the (hopefully benign) tumor. Even with the best outcome, recovery from this surgery is expected to be about a year. I don't have to tell you how I feel or what I'm thinking right now. You already know. You're already feeling it and thinking it. and approach thee with confidence. of all who have recourse to thee in time of need. We rely on thy childlike power over the Father’s Heart. thou sendest roses of pity to those who seek thy help. to which thou dost not respond with love. from the place that is thine in Heaven. Descend to us, Saint Thérèse. a sign of thy compassion, a pledge of thy assistance. in every place and on every continent? lest we wander from thy little way. in the brightness of the heavenly fatherland. Know that I am praying for all of you as we are all praying for Nicole. Thank you! Sending prayers! 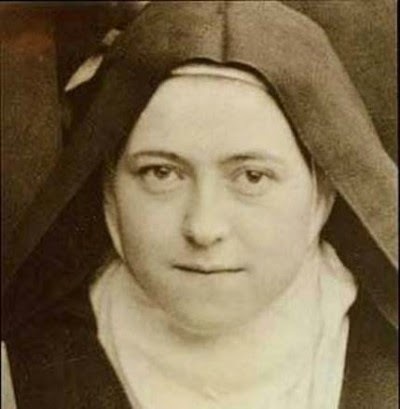 I love St. Therese too. I will be praying and offering up my petty sacrifices for Nicole and her family. P.S. You WERE lovable in college, pre-conversion and all. Tommy's no fool. Thank you for sharing so that we can pray for her and her family! God Bless them! oh Gosh. Little Therese LOVE mothers! She'll help!! I'll be praying! Praying. Thank you for letting us know. Thank you Dwija so much for telling us about Nicole!!! Bless you for that and Jesus save our sweet friend and her sweet baby!! !